Panera, Corner Bakery and the Radnor cafeterias buy pre-grilled, pre-cooked, frozen chicken patties from a commissary in Minnesota. Then they thaw them out and serve them to you. 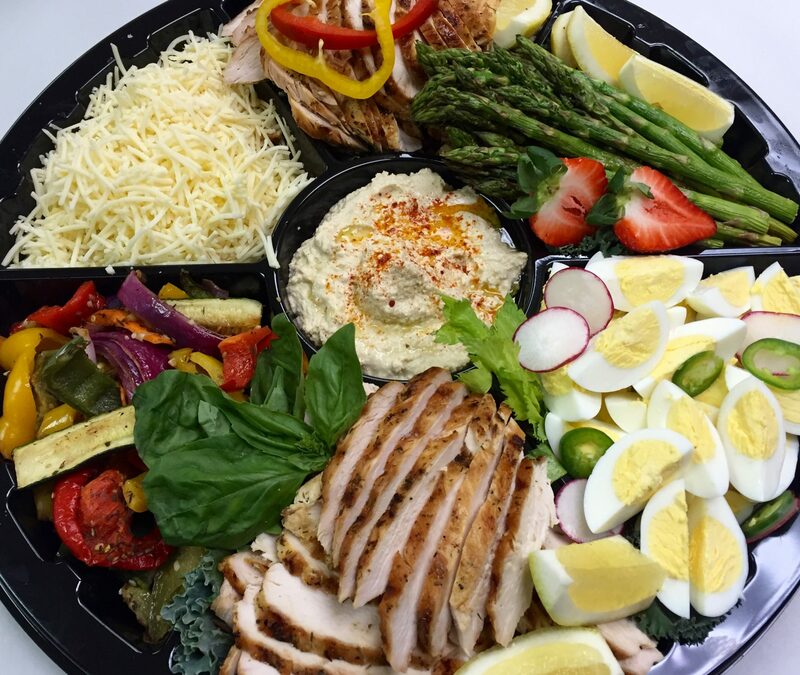 No other caterer in the area (other than Panera) uses all-natural, antibiotic-free chicken. Our chicken comes from smaller, humanely-raised birds to yield a more tender product that actually tastes like chicken! Then we grill them grill them up daily- especially for you! Our dairy is 100% organic. Nobody else does this! You will taste the difference! We welcome the chance to showcase our state-of-the-art kitchen and Café on Mondays and Fridays if you ever want to come over and see how we make everything fresh daily (and also how clean our kitchen is!). Tomatillo Glazed Chicken Skewers (all-natural, always! )- a voluptuous, sweet & sour salsa with a brightening tang. Kurt’s Homemade Orange-Habanero Crema- for zesty empanada-dipping! ADD Tequila Lime Shrimp Skewers for just $5.99 per person- super-jumbo shrimp, zesty from a bath in fresh lime juice, cilantro and just the right amount of tequila! ADD Char-grilled Sirloin Steak for just $3 per person- because who doesn’t want to add juicy steak to their menu? A lite & healthy spread, all served separately (salad-bar-style)… so your guests can construct their own salad OR sandwich. Sure to satisfy all special diet requests…low-carb, gluten-free, vegetarian, vegan, etc. Fresh Lemon Wedges & Basil Leaves- for zesty squeezing! Cute, Sliced Le Bus Dinner Rolls- rolls are sliced for those who want to make sandwiches! Ravenous Wraps In the Spring ! Grilled Lemon Chicken- with all-natural chicken and julienne veggies rolled up with iceberg lettuce and tomato. All orders come with a tablecloth, paper products and serving utensils. We deliver and set up anytime, anywhere. A delivery charge of 15% will be added to invoices for weekday deliveries arriving between 6am & 3pm (after 3pm there is a 25 person minimum). We advise all orders for the next day be made by 3:00pm for optimum delivery time. Events outside of these business hours will carry a 20% delivery charge. For all deliveries to PSU Great Valley campus, we charge you a 12% catering commission charge (which is paid directly to PSU) in addition to the delivery charge. Gratuity is optional, but cash gratuity is much appreciated. If you pick your catered order up, there is no delivery charge. Due to the extensive planning that goes into each order, all orders placed after 7pm for the following day will carry a $25 Late-Order Fee. For delivery information, please go to Delivery Area. Based of the size of your event, additional attendants may be required for set-up, serving, and breakdown. Attendants / Bartenders are billed at $80/hour, On-site Chef at $100/hour. Due to the extensive amount of planning that goes into each order, all cancellations or reductions must be made by 12:00pm of the previous business day to receive a full refund. If you don’t want to take the food, we will be happy to deliver your order to the charity of your choice within our 7 mile delivery radius. Where does Croc Cater deliver? (please see “Delivery Are & Directions” for minimums): Wayne,19087, Radnor, Audubon, 19401,Chesterbrook, Malvern, 19355, Berwyn, 19312, King of Prussia,19406, Trooper, 19403 Exton, 19341, Oaks, 19456 Norristown,19401, 19404, Paoli, 19301, Valley Forge, 19484, 19482, 19485, 19493, 19494, 19495, 19496, Frazer, Conshohocken, 19428, Saint Davids, Strafford, Daylesford, Villanova, 19085, Bryn Mawr, 19010, Gulph Mills, 19428, Rosemont, Lionville, 19353, Downingtown, 19335, Great Valley, Chester County, Upper Merion, Montgomery County, Pennsylvania(pa), Philadelphia, Wilmington, DE, Berwyn, 19312, West Chester, 19380.